We put the same matchless attention and care on a single tree as on a whole park or property. We created a protocol for pruning two ancient elms in a city park, preserving what otherwise would have been lost. We took 20 hornbeams in a New Jersey garden into a double allée of standards. We took a barren median in Manhattan, and made it into a garden of oaks, zelkoovas, roses, arborvitae and viburnum. An elderly Italian couple had been told their huge horsechestnut was a danger. We proved it was not and helped them prepare it for its next decade. The Metropolitan Museum needed someone to create the formally pruned trees for a new plaza. We trained them in the nursery and now we train them in the field. For a major city park, we performed the tree inventory that guided renovation. We have been caring for the 200 hundred trees there for a decade now. Recently, we helped them to prepare a succession plan to envision and guide their planting for their next hundred years. 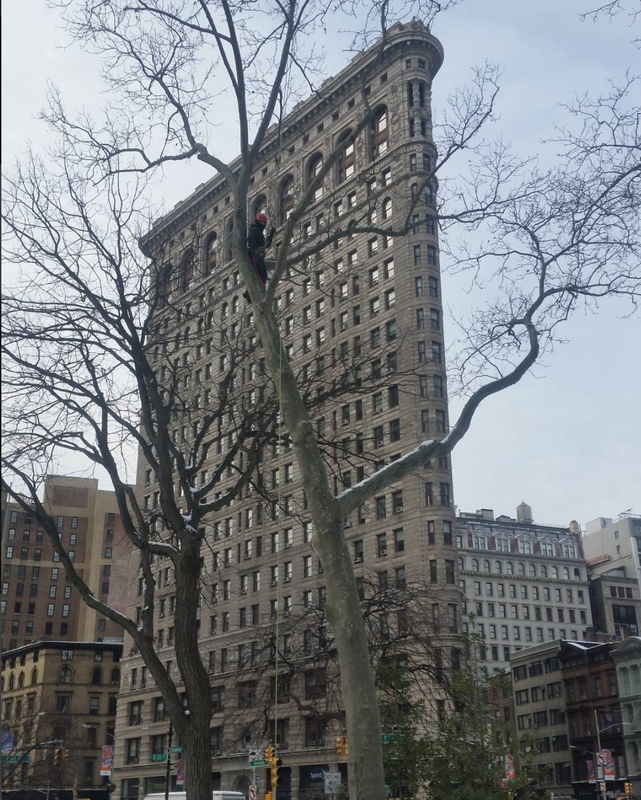 "I have been working with Urban Arborists for the last six years on tree pruning and tree pit work in the Village Alliance district. Bill Logan's knowledge of trees is unmatched." We first started working in this major public green space when we noticed driving by that their many mature cherry trees had a serious insect pest. We controlled the pest, and have been pruning and caring for the entire space ever since. Recently, we began to provide them with flowering plants as well as trees and shrubs. The largest privately owned public space in Manhattan belongs to a church. We plant, diagnose and care for the trees on their entire 13 acre campus. When new gardens and playgrounds were installed, we did the planting, and now 15 years later, we still care for the entire space. There is a common garden behind a dozen brownstones occupying two streets in midtown Manhattan. E.B. White’s famous Second Tree from the Corner was among its woody plants. We cared for it until it was about to fail. Now we maintain cuttings from it. We also take care of the trees and shrubs in the gardens. A woman in New Jersey saw a picture in a book of two dozen hornbeams set in a double allee and pruned so that they were identical. She planted the trees but had no idea how to prune them. That was where we came in. We set up an elaborate, moving frame to allow us to turn 24 trees into a double allee of identical standards. We examine many of the New York City Parks Department’s great trees. These tree are very old and very large. Failure of stems or of the whole tree would likely result in serious harm and damage. We perform climbing inspections that include tree risk assessments of every inch of trees that are 90+ feet tall. A client needed to make an addition to their house on the upper west side. They though they needed to remove a large weeping cherry in their back garden. By a combination of careful Airspade investigation and pruning, we proved that they could keep the tree and pruned it so that the new third-story bedroom window will be embowered in the blossoms of the tree. For two decades, we have been working with a number of the great garden-centered apartment complexes in Jackson Heights. One of them was full of neglected, enormous Norway maples at the start. We have gradually planted other trees – bringing in 3” caliper trees through narrow underground stairs – and have helped shape and design all their woody plants as they have gradually created a fine, large garden in the space. When new building was planned for the west side of the American Museum of Natural History, the local neighborhood was told that a number of trees would have to be removed. A neighborhood association hired us to examine the trees and pursue alternatives. As a result of our work, two major trees have been saved.